Research activities of this group focus on the combination of radiation (X-ray, UV-A, visible light, ultrasound) with radio-/photo-/sono-sensitisers and/or nanoparticles to develop diagnostic and therapeutic (nano)technologies. For example, photodynamic therapy (PDT) of cancer is a two-step therapeutic technology in which the topical or systemic delivery of a tumour-localising photosensitiser is followed by irradiation with visible light. The light-absorbed photosensitiser then transfers the light energy to molecular oxygen, generating reactive oxygen species that kill tumour cells. The absorbed energy of the photosensitiser can also be released via fluorescence, which can be utilised for the photodetection (PD) of tumour. This project uses the PDT principle to develop a technology to photodeplete highly proliferative/activated T cells that are involved in malignant and non-malignant diseases. 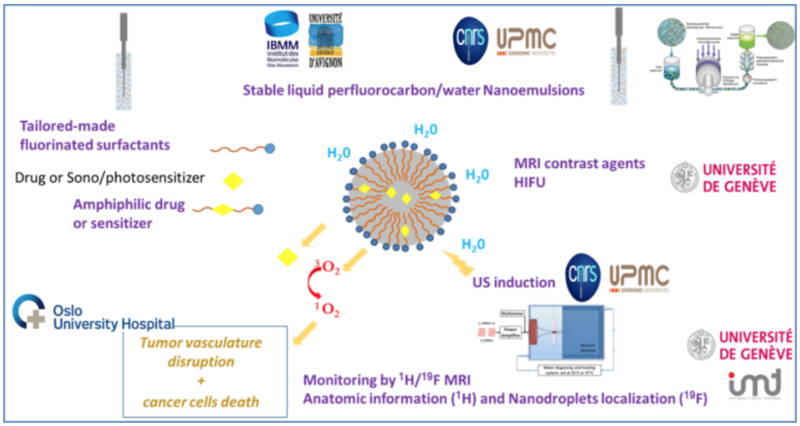 This EU project aimed at developing liquid-cored stable nanoemulsions (NEs) of perfluorocarbon suitable for tumor imaging and controlled therapy. These NEs were optimized with a fluorinated surfactant ensuring their water solubility and stability. Thanks to their fluorinated core the NEs can be detected by 19F MRI or by echography after vaporization. The core/shell of the NEs can also be loaded with a sono/photo-sensitizer (eg. PpIX) to induce ultrasound- or light-mediated tumor damage. This EU project develops a bimodal cancer treatment modality by combining two clinically used radiotherapy and photodynamic therapy, mediated by theranostic nanoparticles (composed of nanoscintillators and photosensitisers). 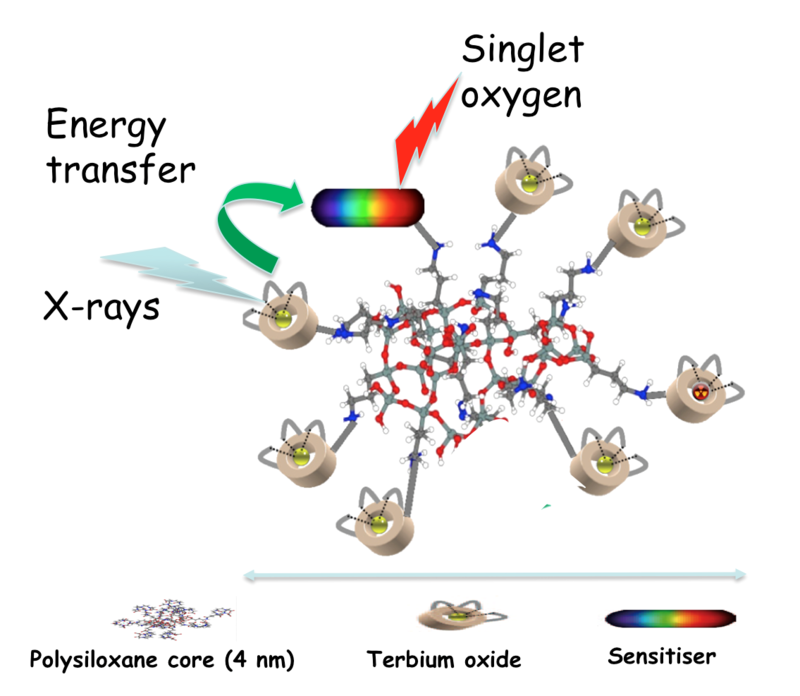 Upon exposure to ionizing radiation the nanoscintillators (polysiloxane core/terbium oxide) transfers the X-ray energy to the tethered photosensitiser that produces cytotoxic singlet oxygen. With this novel therapeutic approach the problem of limited visible light penetration into solid tumour tissue in PDT can be solved. In addition, this new modality will allow treatment of deep tumours with lower radiation doses than those in conventional radiotherapy.